Has your guitar playing ever fallen apart and sounded sloppy as you approached your top speed? I know mine has…and I used to think (like most guitarists think) that I simply “lacked speed” and needed to “move my hands faster” to make my playing sound good at higher tempos. This is the approach many guitarists take, and this is why they always struggle when trying to play guitar fast and clean and never seem to improve. Until you solve the core problem that causes your playing to become sloppy at higher speeds, no amount of “speed exercises” will help you master guitar technique. The first element is eliminating all unwanted guitar string noise (read more about this element by checking out this article on how to eliminate guitar string noise). The second element is playing with perfect two-hand synchronization. Two hand synchronization simply means your ability to fret and pick each note together at precisely the same moment. 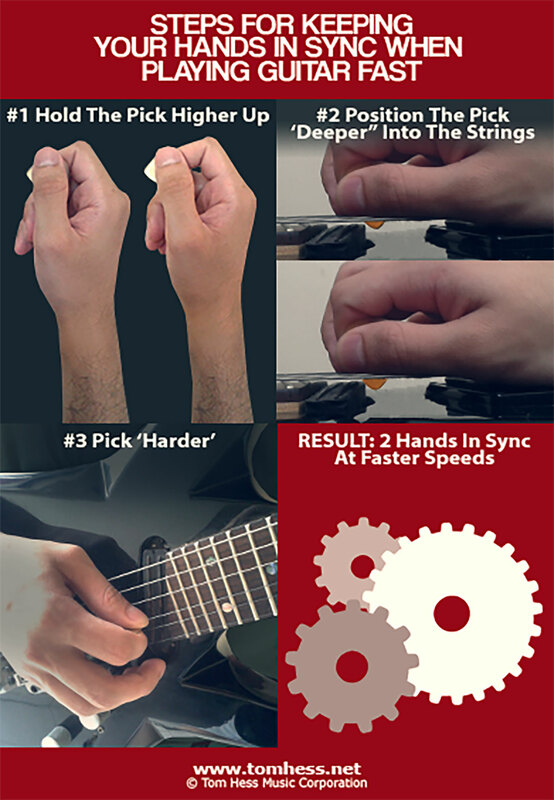 Once you have mastered two-hand synchronization, you will be able to play guitar fast without muffled, inarticulate notes or sloppy noises that come from picking the string when it’s not being fretted. Now that you’ve watched the video above, make the following (simple) adjustments in your playing to make your fast guitar playing sound clean, clear and precise while developing stronger synchronization between both hands. One of the worst guitar playing habits to get into when playing guitar fast is to hold the pick so close to the tip that only a few millimeters of it are exposed to the string. This will cause your guitar playing to lose clarity and sound very weak - ESPECIALLY when you are playing without distortion. Instead of doing this, hold the pick a little bit further back when you play. 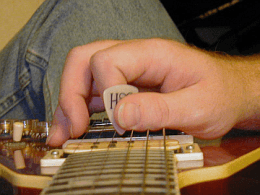 Holding the pick further away from the tip will ensure that only the pick comes into contact with the string you are playing (rather than your thumb or the picking hand fingers). This will prevent you from playing unintentional harmonics or disrupting your 2 hand synchronization. In addition, this will make it easier for you to feel with 100% certainty when both hands strike the string at the exact same time and when they do not. Learning this sensation is (or should be) the #1 most important goal of your 2 hand synchronization practice (more on this below). Although it may seem “unnatural” at first to hold the pick in this manner, continue holding it this way for a few weeks. This is a very slight adjustment (that won’t take long to get used to) and it will have a MASSIVE effect on the quality of your guitar playing. Watch the video above to see proof of how much of a difference this can make in your guitar technique. Stick the pick further down into the strings (towards the guitar body) when you are playing - don’t just brush the very tip over them. This will instantly give your notes more volume and clarity (without using any extra effort). This adjustment will be very easy and natural to make, once you get used to holding the pick further away from the tip. Note: Do NOT overdo it by sticking “too much” of the pick in between strings - that would be just as bad as “barely” brushing the strings with the pick. To find the “ideal medium”, angle the pick about 45 degrees towards the head of the guitar as you see in the picture above. This will prevent you from going “too deep” into the strings. Holding the pick further from the tip and sticking it a bit deeper into the strings will force you to play with stronger articulation - making it infinitely easier to tell when your hands are in sync (compared to barely grazing the strings with the pick). It’s simply impossible to articulate the notes clearly while your hands are out of sync, so improving your articulation will force your 2 hand synchronization to improve at the same time. A common mistake people make while playing guitar fast is not using enough force in their pick attack. Unlike your fretting hand (which should generally be using as little energy as needed to fret the notes), your picking hand should often use MORE force (in comparison) to articulate each note you play. This will make your playing sound more clear and prevent it from turning into a sloppy mess whenever you play guitar fast. Step 1: Choose any short and repeating exercise (like the one below) and practice it by implementing all the adjustments described in this article. It’s important to use something that is very simple to play and memorize, so you can focus EXACTLY on the technical elements you are practicing. Step 2: Play the exercise for a one minute using A LOT of force. After the minute passes, play with much less force for another minute. This will force you to pay close attention to the precision in your picking hand (and will make it infinitely easier to keep your hands in sync). Step 3: Pick each note in the lick while using only downstrokes for 1-2 minutes. Step 4: Pick each note in the lick while using only upstrokes for 1-2 minutes. By both picking with extra force AND using exclusively downstrokes / upstrokes, you will MASSIVELY improve your ability to play articulate, crystal-clear notes at high speeds with great two-hand synchronization. Step 5: Repeat this entire cycle (the 4 steps above) for a total of 10-20 minutes. Now that you understand the steps required for playing guitar fast and clean with excellent two-hand synchronization, apply the concepts you have learned into every lick, exercise and solo you play. Over time, you will see great results in the quality of your speed guitar playing. To learn how to go beyond merely playing guitar faster and master ALL elements of your guitar technique and musicianship, work together with a rock guitar teacher who has already helped others to become kickass musicians. Reach all of your musical goals fully by taking rock and metal guitar lessons online.